Beauty Black Book Recommendation: Waxing at Bliss Spa | Fashion. Style. Beauty. | Life is short. Live well. I don’t normally give away the information on my personal glam squad but when a girl comes across a dedicated and relatively pain-free waxer, you feel obliged to share with your nearest and dearest. Waxing isn’t a topic of conversation that anyone really relishes but let’s be honest here, ladies: it’s a necessary evil and for those of us who are devotees of its results, the quest for a relatively painless wax from a professional who doesn’t beat you into submission is like the Holy Grail of beauty treatments. I have found mine in Aldona at Bliss Soho here in NYC. I can honestly say that it doesn’t matter what treatment I’m having done: Aldona is always consciencious, very careful and extremely fast. Bliss’ signature pain-free wax is always the right temperature and has conditioners to grab onto the hair rather than the skin. I have never had any issues or pain afterwards. I found a great laser hair removal at home that makes my life easier because then I don’t have to go out and get waxed every couple weeks. In a word, the woman’s work is flawless and I am a faithful devotee. If you’re in need of a waxing treatment in NYC, call 212-219-8970 and request my dear, sweet Aldona for the best results of your life. 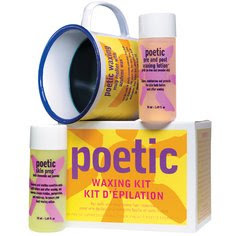 If you can’t make it to NYC and you’re keen to try Bliss’ amazing wax at home, I highly recommend purchasing their Poetic Waxing Kit. Take two Ibuprofen or Aleve beforehand and you’ll sail right through it.